Helen (from Singapore) and Siva (from Malaysia), seen on the right hand side of this photo enjoying their second Christmas dinner of three, left the farm yesterday after being part of our Christmas WWOOFing team for the past two weeks. We'd like to thank them for their help, and we wish them a happy new year 2017. Small (£6) veg box - a stick of Brussels sprouts (from Cargease Organics), leeks, kale, potatoes, onions and parsnips. Standard (£10) veg box - potatoes, leeks, carrots, red cabbage (from Cargease Organics), swede, a stick of Brussels sprouts (from Cargease Organics), parsnips, kale and onions. 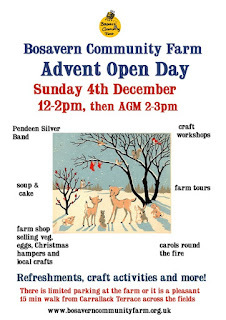 Bosavern Community Farm 2016 Christmas hamper. an organic red cabbage, organic savoy cabbage, a stick of organic Brussels sprouts, a jar of Christmas chutney, apple juice, vanilla fudge, raw chocolate with coffee beans, clotted cream shortcake biscuits, flavoured sea salt, 4 organic mince pies, and an organic hazelnut and cranberry loaf (all from the local area). Laia, from The Catalunya region of Spain, will be heading home for Christmas tomorrow, before returning to the farm in February to continue her volunteering with us. Laia has been a bedrock of our wwoofing team this autumn, and we look forward to welcoming her back after a well deserved break. Laia collecting eggs at the chicken sheds. Laia planting garlic in the market garden. Laia planting watercress in the Mothership polytunnel. Laia has done so much on the farm that she deserves 3 photos! Many many thanks. Nathan, from France, will be leaving us to head back home this evening, and we'd like to thank him for his help over the past 6 weeks, and wish him a wonderful Christmas with his family. Nathan painting the farmhouse porch ceiling. Some of our £6 veg boxes set out on shelves in the packing shed. Small £6 veg box - potatoes, pumpkin portion, savoy cabbage (from Cargease Organics), swede, carrots and leeks. Standard £10 veg box - pak choi, savoy cabbage (from Cargease Organics), pumpkin portion, cauliflower (from Cargease Organics), onion, leeks, carrots, swede and beetroot. The farm would like to send a great big thank you to Andy, from Surrey, who spent two months on the farm as a WWOOF volunteer, and made an invaluable contribution to the farm through the autumn. Andy with a giant leek in the packing shed. Timetable of the Advent Fair activities. 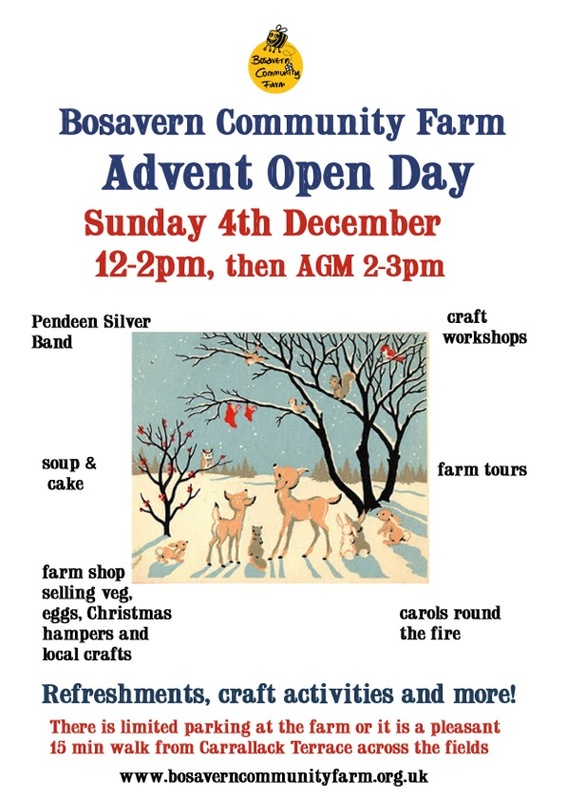 Sunday 4th December saw the community farm host our annual Advent Fair, a low key celebration this year due to the high winds forecast and the clashes with other festive events in the local area. But it was a quality afternoon enjoyed by a small and appreciative group of people. 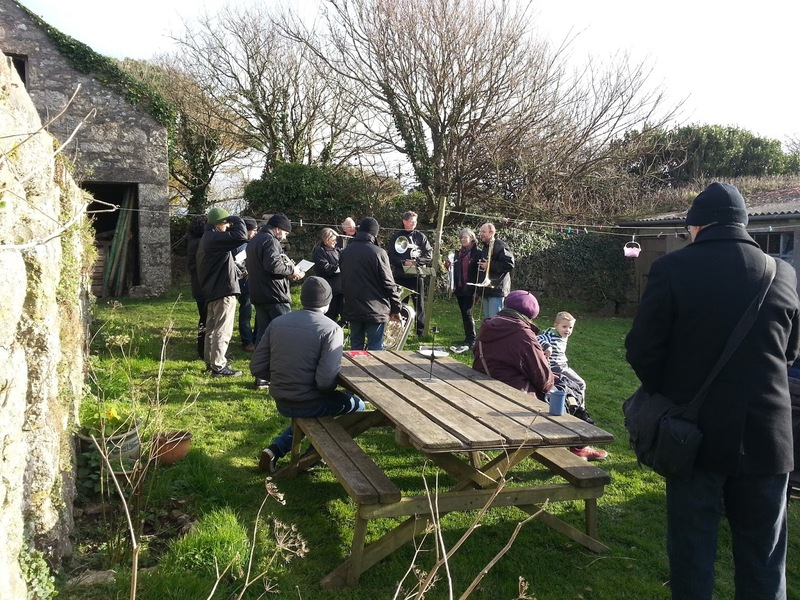 Members of Pendeen Silver Band preparing to play carols in the farmyard. Sennen setting up the Cow Shed pop-up cafe. As always we'd like to thank everybody who helped in the run up to the event and on the day itself, with the baking of mince pies, cooking and serving of soup, stocking and tidying of the farm shop, and all the other little and large jobs that go in to days like this. And of course to everyone who came along on the day to help us celebrate the season, including several members of Pendeen Silver Band who gave up their spare time to play carols around the campfire. Last Friday our small £6 veg boxes contained Sarpo Mira potatoes, Chinese cabbage, leeks, onions, beetroot, and parsnips. Our standard £10 boxes contained all the above plus carrots, chard, red cabbage, and leafy celery. Sophie, from France, one of this year's long-term volunteers, left the farm on Tuesday to head home for Christmas then college. Sophie planting coriander in the Mothership. Many many thanks to Sophie for all her help over the past two months, and all the best for the future. £6 veg box (or £7 delivered to your door) - Sarpo Mira potatoes, mixed kale, leeks, a pumpkin portion, swede, and carrots. £10 veg box (or £11 delivered to your door) - Sarpo Mira potatoes, leeks, the last of this year's peppers, mixed kale, carrots, a pumpkin portion, beetroot, parsnips, swede, and flat-leaved parsley. Yesterday morning the eagerly awaited bee ed shed arrived and was constructed in our developing bee sanctuary, where it will form the centrepiece and act as a classroom, display hive, and pollinator education area. A group of farm volunteers welcoming the new bee ed shed. Today's standard veg box (£10 to collect or £11 delivered to your door) - potatoes, kale, oriental stir-fry greens, pumpkin portion, celery, leeks, onions, beetroot, carrots, and peppers. Today's small veg box (£6 collected or £7 delivered to your door) - pumpkin portion, potatoes, kale, leeks, peppers, and beetroot. Our Advent Fair will be held on the farm from 12 till 2pm on Sunday 4th December, with a range of festive activities, and we are hopipng that some musicians from Pendeen Silver Band will be able to come and play carols around the campfire for us all! Please come and join in the communal celebration, and enjoy a bowl of hot soup and a mince pie with friends. We are now taking orders for this years Christmas hamper. 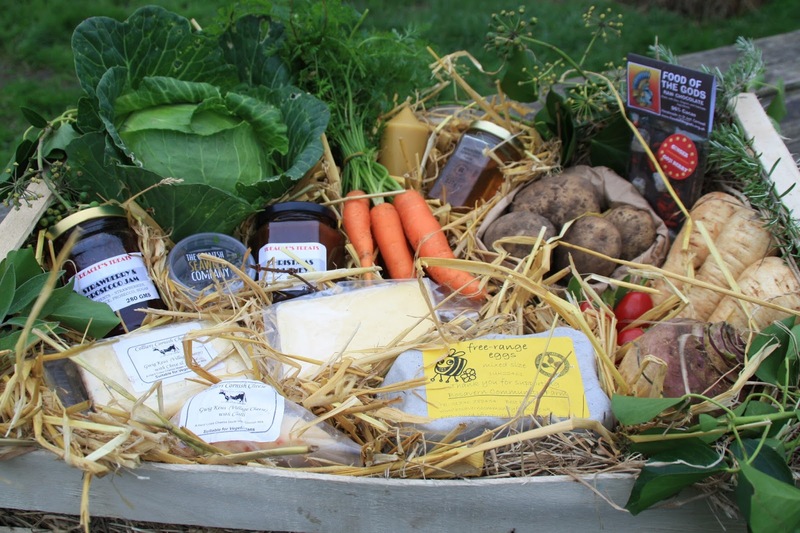 Each hamper contains a selection of fresh seasonal vegetables, free-range eggs, black bee honey, fresh herbs (all of these are from the community farm), plus a range of quality local goodies. They will be available for collection from the farm on Friday 23rd December, or we can deliver that afternoon as far afield as Penzance for only £1 delivery charge. Our hampers make ideal Christmas gifts, or will provide most of your needs for the festive period, and cost £50. Please contact us on 788454 to order yours. my unknown future has finally begun. trees that talk and emotions of peace. organic smiles and broken chimneys. as my captured energy is released. Andy is currently volunteering on the farm as a wwoofer, and wrote this poem whilst sitting outside the cob roundhouse. This weekend's £6 veg box contained 400g of leek(s), 500g of carrot(s), a bag of salad leaves, 200g of kale, a pumpkin portion, and a kilo of Sarpo mira potatoes. The veg box shown above also contains a litre of organic Treen full fat milk (£1.20), an organic large sourdough loaf (£3.10), and half a dozen free range eggs (£1.50). Delivery to your door is £1 extra. The £10 veg box also contained a purple pak choi (or 200g of Swiss chard), 400g of baby parsnips, and 200g or oriental stir-fry greens. The community and its farm would like to thank Tristan, from France, for volunteering with us for ten days, and we wish him happy wwoofing on his next farms. Last week's £6 veg box contained onions, peppers, a slice of pumpkin, leafy celery, potatoes, and mixed salad leaves. Last week's £10 veg box contained all the above, plus beetroot, leeks, and a swede. Please contact us on 788454 to order yours! Doug clearing tomato vines from the Sausage prior to planting winter crops. We'd like to send many thanks to Doug, who volunteered on the farm for five weeks, and left recently for Bristol. Thanks for all your help, and we wish you all the very best for the future. Small (£6, or £7 delivered) - 200g red Russian kale, 1kg Sarpo Mira potatoes, 500g Chioggia striped beetroot, 500g Autumn King carrots, 400g leeks, and three peppers. Standard (£10, or £11 delivered) - all the above plus 100g mixed salad leaves, 200g rainbow chard, and 3 hot jalapeno peppers. Local artist Ray Hopley has donated his artwork called "Moonbird" to the community farm, and we have mounted it on the side of the open barn at the entrance to our Bee Garden, where it looks great and can be seen from the edge of St Just. Many thanks to Ray for his generosity. Many thanks to Jess who came down from Bristol to volunteer on the farm for two weeks, especially for her help in getting our Mothership polytunnel up and running again (seen below in the final photo of the polytunnel re-skinning entry). A group of students from Mounts Bay Academy visited the community farm in the summer, and if you follow the link pasted above then scroll down to page 4 of the pdf document, you can read their write-up of their visit. Our next workshop is “Landscape Painting at Bosavern Community Farm” led by local artist Jane Sand, on Thursday 17th November 10.30am till 3.30pm. The cost is only £5.00, plus a contribution for refreshments and materials. Everyone is welcome including absolute beginners. Please contact Sonja on 01736 785773, or text Jane on 07790 512 787, to book your place. This year's leeks are probably the best we have ever grown, and we should have several month's supply of them over the winter - yum! We chose 8 varieties all with different harvesting times to give us a planned succession from October to May, and sowed them in sequence in a seedbed in a polytunnel at the very end of February. In July we transplanted them in sequence into the market garden, into long lines of municipal compost, watered them in and left them to grow, with just some weeding to help them along. March, leek seedbed sown amongst the winter crops in a polytunnel. July, transplanting leeks by hand into the market garden. October, Andy with a giant 700g leek in the packing shed. Leeks now on sale in our farm shop. A small veg box (£6) with a dozen eggs (£3) - mixed salad leaves, Picasso potatoes, golden pak choi, peppers, onions, and a Jack-be-Little pumpkin - all for £9 (or £10 delivered). 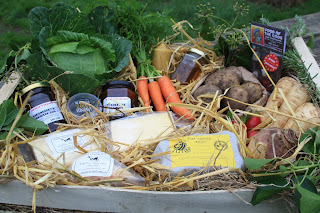 The standard box (£10, or £11 delivered) also contained beetroot, leafy celery, and red Russian kale. Please contact the farm on vegbox.bcf@bcents.org to arrange your veg box. 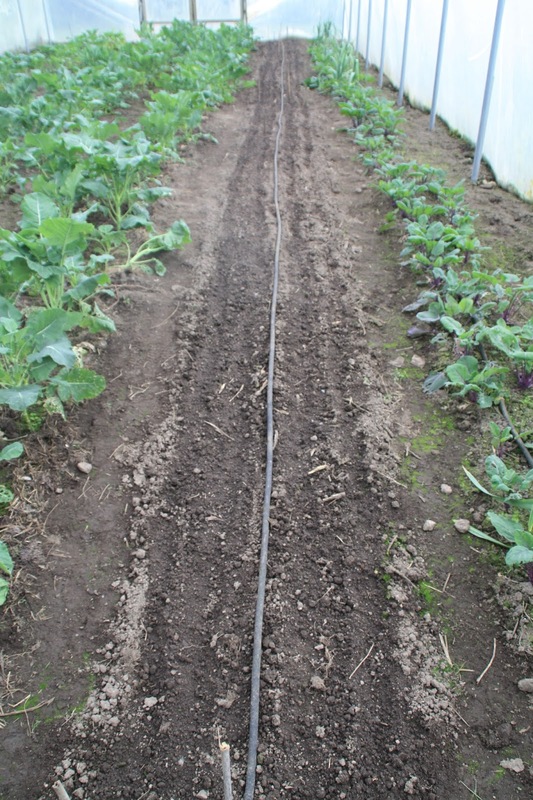 The storms of last winter ripped our oldest polytunnel in several places, and by Easter this year the tunnel was fully open to the elements - which this year have not been too bad and we have managed to produce crops throughout the year from the tunnel. But with winter looming, and a fine day forecast, we took the plunge and reskinned our Mothership on Tuesday 25th October. The remains of our polytunnel this summer, with kiwi vine and physallis bush bursting through the frame. To cover a polytunnel we aim for a sunny calm day and a minimum of ten people. The weather on Tuesday was perfect, and 12 volunteers came to help, making 13 of us in total - many thanks to Aaron, Ben, Kate, Simon, Alice, Deborah, Mirjam, Jess, Doug, Andy, Laia and Ian for their time and labours. ....and Ian's team digging in the east side. The complete skin over the tunnel and being dug in, prior to cutting and battening in place. We started putting the anti-hot-spot tape on the frame at 09:00, after the sun had dried the metal, and had the cover pulled over, centred, and with initial securings in place in time for coffee-break. Then by lunch we had the trenches filled and the cover nicely secure and taut. Most volunteers were able to leave at that point (though some stayed for lunch), leaving a small group to work through the afternoon, cutting out the doorways, and battening the loose edges securely to achieve a tight finish. The afternoon team - Aaron, Laia, Andy and Doug. It has been a mild calm week, allowing us to leave the tunnel to concentrate on other farm work, before returning to it on Saturday to hang the doors and windows, and tidy up the excavations. Doug and Jess at the back of the completed Mothership. Now we have to finish digging over and planting the inside of the tunnel! But it's lovely to have our Mothership back in action ready for winter. Thanks to all! Mirjam (pictured above organising our punnets in the packing shed - not the greatest job but it didn't half need doing! ), from Germany, left the farm on Tuesday to move on to her next wwoofing experience on Dartmoor. Many thanks Mirjam for all your help, and especially for delaying your departure to help with the polytunnel skinning on Tuesday morning (and sorting those punnets..). Doug and Mirjam clean-picking ring-o-fire chillies in the polytunnel. Chillies joining the onions and squashes in the propagation station to dry. Jack Be Little squash laid out to ripen in the polytunnel. Part of this year's squash and pumpkin harvest.